Voulez-vous écouter avec moi? Dubmatix is back with a release inspired by the reggae-loving inhabitants of Europe's sun-drenched hexagon state. 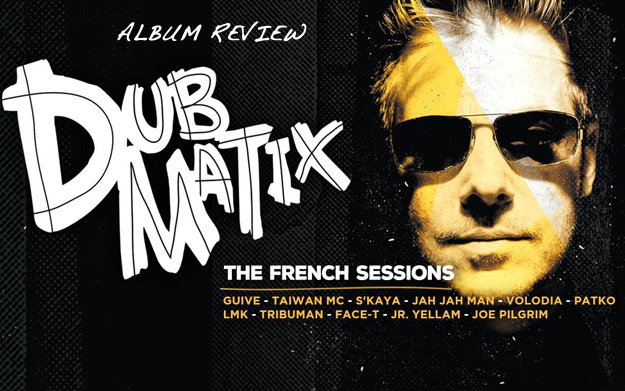 The French Sessions are an homage to France's vibrant Dub-scene who fell in love with Jesse King (and whom Jesse fell in love with) during his various shows over the last few years. Actually, he probably has his largest fan-base there - whenever he is on tour in the country (so far, he has played over 200 gigs! ), he is welcomed like a long lost friend. This mutual devotion led to the present release which includes 11 tracks of diverse styles. Featured are as many singers, hailing from all corners of the world but having in common their base in France. Their names might not (yet) be known internationally, but this exactly adds to the charm of the album – fresh voices to the world! In a funky mood, Guive and Taiwan MC open the oeuvre with Dangerous, informing us about the dangers of the total data supervision: "My cell phone is an informer!". Featuring S'Kaya, the next track is a shout-out to his African Brothers which, according to him, includes all earthlings. The Africa-theme is picked up again by Joe Pilgrim in the like-named song, only that he focuses on the actual continent and calls for unity. Similarly serious issues are discussed in Crisis. Patko addresses militant leaders and global warming to a wonderful background of an acoustic-guitar-lounge-riddim. Dub And Ragga sounds like a love-letter to these genres, both lyrically and in the vibrant construction of the underlying sounds. Especially Jah Jah Man's shout-outs to artists, composers and sound-systems are a nice appreciation of all the contributors to our beloved music! Speaking of... nothing less but entirely enchanting is the riddim track for Fais Tourner, not only for its incorporation of the sweet Under Mi Sensi theme, but also because its soft notes remind me of something, a memory or emotion I can't quite put my finger on. Plus, Volodia does a really good job riding the riddim. Boom! The only lady among the singers is the mysterious LMK. Her sweet voice enticed me last year when I stumbled over the album Sing A Song by Taggy Matcher in which she is prominently featured. Here, she croons painfully honest on the laid-back So Bad. She appears again alongside Volodia on Are You Ready, a dedication to the big Reggae Sun Ska: "One fi di Reggae, Two fi di Sun, Three fi di Ska from Bordeaux to Kingston…" invites you to both sing along and take a trip to the festival, which is up and running from 7th to 9th of August. The festival feeling is consolidated in Mercedes – what a beat! Tribuman is riding it in exactly the right flow to convey that sweet summer feeling lying ahead of us. While Face-T, like Guive, doesn't really convince with singing skills on We Run The Game, the Ragga part is wicked. Of course, a Ganja-tune can't be left out, so Jr. Yellam sees to that in Let The Good Time Roll. What I do miss, however, is the French in the sessions. Even though most artists obviously struggle with pronunciation and lyricism, the language of the songs is almost exclusively English, except for three tracks. We need more linguistic diversity, and French is such a beautiful language! Beautiful, too, are The French Sessions. By sending the tracks to the artists, letting them voice their favourite ones and finally re-arranging the songs once more, adding some additional spice with overdubs by the Heavyweights Brass Band, for example, the whole work became a collaborative effort, recorded, mixed & mastered at The Dub Factory (Toronto). Dubmatix managed to combine and transform the impressions of his travels in his unique manner to create lasting pieces of audio-magic. Or, in his words: "I want this album to represent, in my own way, all the music and artists I’ve met in France!" Bien foutu – merci beaucoup!